Seafarer is proud to announce its first income in 11 years. 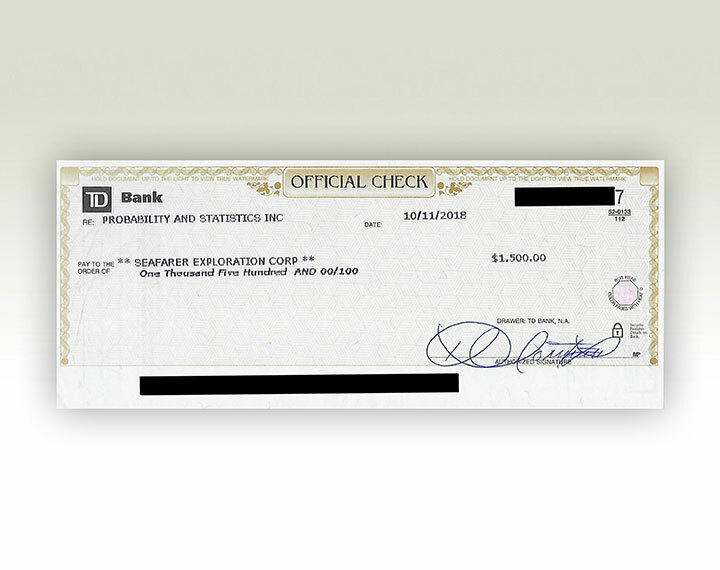 Seafarer has received their first dividend check from Probability and Statistics, Inc. While the check is only $1,500 for Seafarer’s 1% position, it represents the start of a promising future. Seafarer, through its wholly-owned subsidiary Blockchain LogisTech, LLC, looks to generate more revenue from Probability and Statistics by fostering blockchain encryption services and profit sharing. Blockchain encryption is proving to be a dynamic field that is growing into its own industry sector. There are also companies seeking to enter the cryptocurrency market that will be seeking to utilize Probability and Statistics’ advanced technologies through Blockchain LogisTech. Any company needing these software services, please contact Kyle Kennedy at Blockchain LogisTech: (813) 448-3577.